With St. Patrick’s Feast conjuring up images of fun, laughter, dancing, Guinness and all things Irish, the Royal Malta Yacht Club certainly did not want its members to miss out on any fun and to this effect organised a jam packed weekend of racing, sailing taster sessions and a fun filled party held in the Club’s Restaurant. Although quite a few boats are still on the hard, a number of yachts made the necessary arrangements to participate in what was the first weekend regatta for keelboats for 2016. 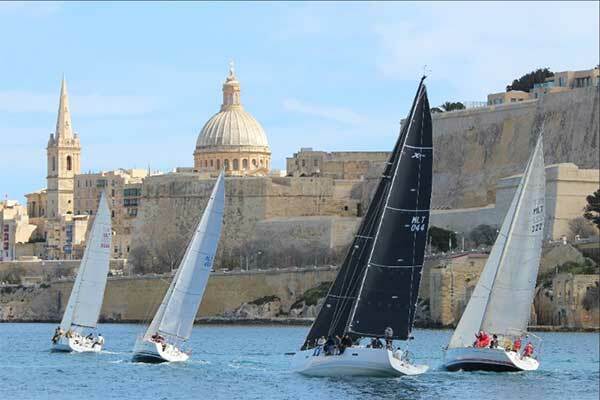 Two coastal races were held over the weekend, both starting inside Marsamxett Harbour. Saturday’s race saw all yachts heading north towards Comino. With the gusty conditions inside the harbour, there was already some action going on. Sean Borg’s Xpresso was first to get the clear winds exiting the harbour, closely followed by Mario Sant’s Time Out, Anton Calleja’s Lartista followed by Godwin Zammit’s Inspiration. The fleet had the perfect 15 knot breeze getting to Comino before being let down by the same wind after it had become very light round Comino. Unfortunately, Xpresso was the only boat to manage the time limit on Saturday leaving them with a very strong position for Sunday’s final race and overall prize. Sunday was yet another beautiful day with Southerly winds and flat calm water. A course was set round the Munxar mark and back to the Yacht Club. Two yachts, Xpresso and Time Out fought it out till the last second, leaving no room for errors. Ultimately it was the Xpresso crew who managed to emerge victorious once again making them the weekend’s overall winners. On Saturday evening, members and their friends thronged the Club to attend Shamrock & Shenanigans, a St. Patrick’s themed party. Guests were treated to an Irish themed buffet complete with typical dishes such as Irish stew and Colcannon, Guinness and Kilkenny on tap and accompanied by an Irish band who kept the crowd going until the early hours with lively Irish tunes. As part of its efforts to attract more people to sailing, the Royal Malta Yacht Club Sailing School organised an ‘Open Day’, wherein over fifty people undertook sailing lessons in the harbour. The overwhelming response received resulted in the ‘Day’ being stretched into the whole weekend in order to accommodate all the requests received. Great weather conditions contributed further to the success of this initiative. The weekend came to a close on Sunday afternoon, when prizes for the weekend’s races were given out in the presence of His Excellency the Irish Ambassador Pádraig MacCoscair, who introduced the Beaufort Trophy which was given to the overall winner of the weekend races. The Beaufort Trophy, which was being presented for the first time in the history of the Club was presented to Sean Borg and his crew of Xpresso. Prizes were given to the crews of Time Out and Inspiration who gained second and third place overall respectively. The St. Patrick’s Weekend Regatta was made possible through the assistance of the Irish Embassy in Malta.